It really surprised me that Roy didn’t have a UT Upper Deck card, so initially I was put into a scramble to find some cards for him. 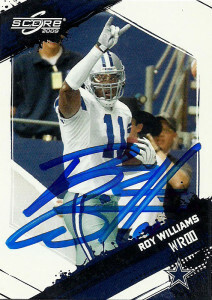 Since I had only started collecting cards again in minutia in 2009, I was short on many of Roy’s great cards. I took the rides at the GMC event and stocked up on autograph passes. Each drive entitled you to one autograph from a player and I intended to carry my surplus into the Sunday event, but that did not come to fruition, as I was later informed by staff that the passes were only good for that day. Undaunted I went ahead and had Roy sign the 6 cards I had with me. I kept kicking myself for not staying around longer though as apparently Roy sat down and played some Madden with fans after he got done signing. I later also gave the extra Longhorn photo that I got from this event to one of my friends. The November attempt for Roy turned out to be a dud. With a much larger crowd than expected and Roy showing up early to start signing, the timing of the event was completely off. Roy’s queue closed 2 minutes after it opened at 2pm, because he wanted to get to the UT game. This left myself, who had been doing test drives dutifully to try to acquire autographs, standing on the outside. It was not a well handled situation, and while Roy looked genuinely sad that he had to leave us standing out looking in, I believe that I will probably be able to grab him at another event again. There was one positive out of the situation, and that was because we had organized a line behind the queue, we formed the basis of the line for the next person coming up- DeMarcus Ware. Roy was a monster at the University of Texas who had the complete package for the Longhorns. In 47 games Roy finished as the school’s all-time leader in receptions (241), receiving yards (3866), and receiving touchdowns(36). He also rushed 16 times for 243 yards and 3 TDs. Roy earned the Cotton Bowl Classic MVP in 2003, after catching 4 balls for 142 yards and a TD, and carrying the ball 1 time for 39 yards and another. 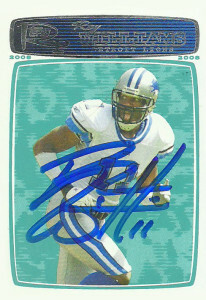 Drafted by the Lions in 2004, Roy was the 2nd of 4 monster receivers that the Lions used their high first round pick on during the Matt Millen administration. Initially fans were unhappy with the pick, but Williams wasted no time establishing himself as the team’s #1 threat, recording 817 yards on 54 receptions, and 8 TDs. 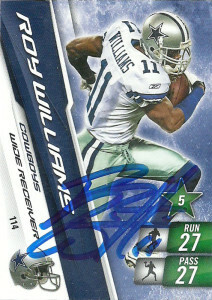 After a subpar 2005, Williams earned Pro Bowl honors for his monstrous injury free 2006 campaign. In it he recorded career highs with 82 receptions for 1310 yards and 7 touchdowns, while averaging some 81.9 yards a game. 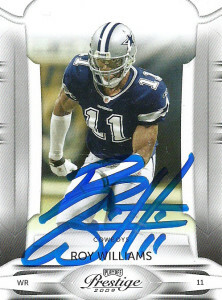 As bigger things were expected with Williams’ emergence, 2007 came as a let down to many as Roy only played in 12 games. Still he managed again to post 838 yards and 5 TDs, including a career high 91 yarder. In 2008, Roy was traded to the right before the deadline to the Cowboys, as the Lions were confident in the arrival of new receiver Calvin Johnson. While the trade was hailed with much fanfare, the Cowboys in the long run were fleeced by the Lions (for once) to the tune of a 1st and 3rd round pick as Roy received a very lucrative extension. 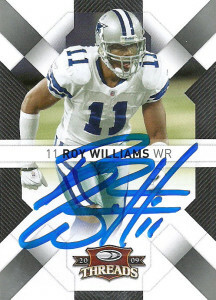 He played the next 2 seasons there with Dallas playing along side Terrell Owens, but probably what really cost Williams his job was the emergence of Miles Austin after Roy sustained a rib injury. Roy was just never able to reestablish that trust as a go to guy between him and offensive coordinator Jason Garrett. 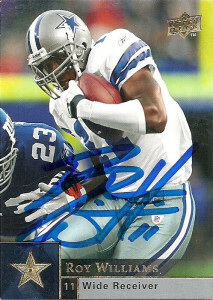 The Cowboys released Roy in 2011, and he ended up signing with the Chicago Bears. After a season there, Roy decided to retire for good from the league in 2012. When I asked Roy, “If he could suit up right now what team he’d most likely play for?”, He paused for what seemed like 15 seconds, and then said he’d do it all over again with the Cowboys. Playing alongside Terrell Owens and catching a few balls from Romo were some great memories.